Dental sealants explained by our dentists at Ballarat Dental Care: Dental sealant with dentist Ballarat is a thin plastic coating similar to varnishing a table, which is used by the dentists in people with deep grooves in their teeth. The varnish flows into the thin groove, making it easier to clean and prevent any new decay. Dental sealants need to be checked by the dentists on a regular basis, for any wear or chipping, as decay can form underneath the dental sealants. 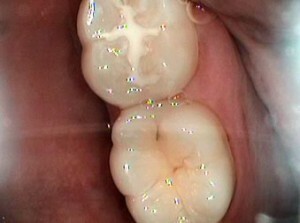 Dental sealants life will depend on each individual tooth. Dental Sealants alone will not prevent tooth decay. A good oral hygiene, a balanced diet and regular dental check-up with the dentists are necessary to have healthy teeth’s without tooth pain. If you need of any dental sealants treatment done at Ballarat, please call our Ballarat Dental Care to book your dental sealants consultation and speak to our qualified dentists doing treatment such as dental sealants in Ballarat.